Family Wellness Rehabilitation * 10 Treatment Modes: Press Knead Vibrate Thump Waist Shoulder Feet Joint Legs Back. 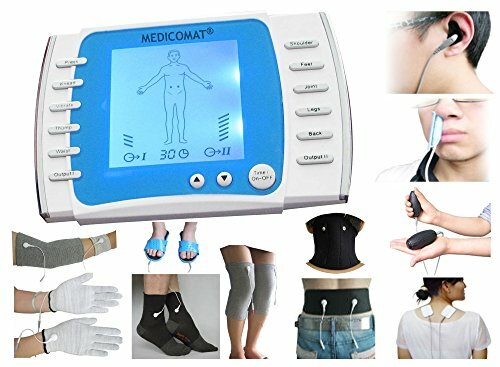 Easy to Operate * Electricity & Batteries * Screen & Time Set * Voice Guide * 2 x Output for Therapy * Double Effect - You can use them simultaneously and choose two therapies at same time for the better therapeutic effect. Medicomat ear acupuncture provides a fully automatic treatment for the whole body, complemented by the effects of Wrist and Nasal Semiconductor low-level (output 1-5mW, wavelength 650nm) Laser Irradiation Therapy and body acupuncture massage therapy through the palm and foot electrodes and conductive silver fiber garments socks, gloves, belt, neck, knee, elbow, wristlet and pads. The conductive garments are made with high quality silver fiber threads which conduct the electrical impulses throughout the whole garment, providing acupuncture and electrotherapy over the complete area covered by the garment. Producing an even distribution giving maximum comfort and efficiency, and complete ease of use.